• Alkalinity suitable for black tiger prawn is from 90 to 130ppm, for whiteleg shrimp is 100-150ppm. • Mix dolomite lime in fresh water for 24h, and then splash it into ponds at 8-10 P.M. at night. • Each 1,655g of dolomite lime increases alkalinity of 1m3 water into 1 mg/ml. • When increasing alkalinity of water in ponds, Viet Linh notices that only increase 1 time 10mg/ml then again, but not too much at 1 time because it will cause shocks in shrimp. • Combine 70% soda lime (NaHCO3) according to the above formula, 30% dolomite lime in fresh water for 24 hours; splash the mixture at 8-10 P.M. at night. • Algae are often blighted. • Shrimps are covered with algae. • The lack of oxygen in early morning often occurs. • Shrimps with black gill disease and other gill diseases. • Use BKC 800 with 0,5ppm concentration. Apply it in 1/3 area of the pond, downwind without aerators. • Take out algae foam that remains after applying treatments for ponds. • Repeat 2 or 3 times these methods. • Use probiotic with a combination of zeolite to absorb toxic gases caused by dead algae at the bottom of the pond. • Limit photosynthesis of algae in the pond; cause the lack of oxygen and high CO2 concentrations that increase shrimp suffocation. • Alluvium clinging in shrimp gills causes swelling or yellow gills. Increase water changes in ponds and use probiotics. • There is a need of treatment pond to change water frequently in the last months. • Siphon the bottom of the pond to take out waste. • Measure the concentration of NH3, H2S, NO2- (NO2- often appear in ponds with salinity <10 ppt). • As soon as it is cloudy and about to rain, the amount of feed should be reduced or even stopped if the rain approaches. Wait until the rain ceases and feed with 30-50 percent feed fewer than the normal amount. • To ensure shrimp resistance and prevent soft-shelled shrimp, synthetic vitamins, minerals and vitamin C can be mixed in feed every day. 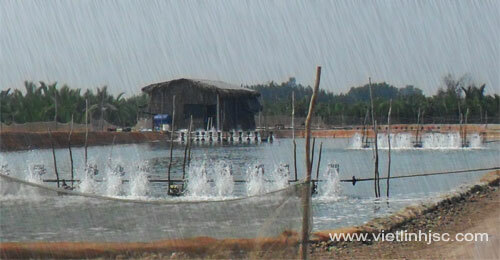 See "Manage shrimp ponds during rainy season - Part 1"